The number one mistake all beginners make is buying a pre-stretched canvas or canvas board from a discount bookstore and not unwrapping the cellophane from it. The number two mistake is leaving the canvas white when they start painting. The first technique I always teach in painting (and a technique I use on 99% of my work) is to cover the white canvas with one solid paint colour which is called a ‘ toned ground’. This is short for ‘toned background’ and is No. 1 of my painting principles. It can be called a ‘toned ground’ or ‘coloured ground’ as it can be used in drawing and painting. Using a coloured ground does a number of fantastic things that are not to be underestimated when starting to learn how to paint. It can transform your paintings by making them look more professional, increase the speed in creating your paintings and give you a fool-proof method of creating a tonal mood in your work…Different artists throughout the ages have used toned grounds in their work, from Turner to Jack Vettriano. Turner used pre-coloured sheets of watercolour paper with different hues (colours) of browns, blues and greys. When faced with a scene he would look through his pre-painted watercolour sheets and select the most appropriate colour. For example, a warm brown for an Autumnal tree scene. Pro tip: It is applied after priming a canvas with gesso if you’re working on a raw canvas. What colours do you use for the toned ground? It depends on the mood and feel you’re after in your painting. You’re trying to imagine what’s underneath the painting and then build opaque layers of colour ontop of this. My preferred choice for landscapes, still life’s or portraits nearly always stem from one of the Earth colours. See: What are my paints made from? Usually either Burnt Umber + white, Raw Umber + white or Yellow Ochre. For the absolute beginner, I recommend using Yellow Ochre. It’s usually included in most beginner sets and can be used diluted with a little water. It’s also brighter than you think so is good at taking you out of your comfort zone. Using Yellow Ochre can cause some hesitation if you are first starting painting as the yellow can seem too strong, but you just need to have a little faith! For example, if you are painting a blue seascape the warm undertone of the yellow can balance perfectly to the cool blues in the scene, adding the feeling of the sun hitting parts of your painting. 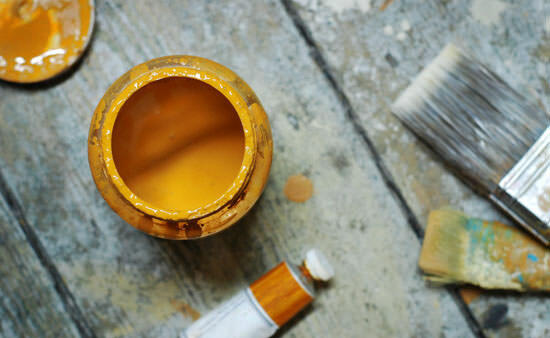 Pro Tip: If you try using the Yellow ochre straight from the tube but still find it a little too strong in intensity for your taste just add some Titanium white to the mix to mute it down – it will give you a colour close to Naples yellow. Are your watercolour techniques ruining your acrylics? If you’re coming to Acrylics or Oils from Watercolour you will naturally use too little paint. Watercolour is based on diluting, Acrylic is based on adding. If you combine scratchy, watery paint onto a white canvas your painting will look amateurish. If you have the same scratchy watery paint on an opaque ground colour your painting will look rocking! The coloured ground is doing all the work for you. How does a coloured ground help me? Bought canvases and boards are nearly always white. When you have a white canvas any colour you paint onto it looks drastically different because of the optical effects and tricks colour plays on you. As a beginner, this can be disconcerting. For example, if you paint a light grey onto your white canvas it will look black. It depends on the brand of paint you’re using. Heavy body paint will need more water than a soft body paint. As I use this technique on most of my paintings I use a fluid acrylic from Golden paints. This has already been mixed in the factory to a thin consistency and has a good level of acrylic binder in the paint and a really nice strong saturation of colour. You can add a touch of water into it and it will still hold the acrylic bond really nicely. If you’re just starting with the technique using standard Acrylics will work fine. Pro tip: Some manufacturers recommend you don’t dilute Acrylics with more than 40 – 50% water due to diluting some of the acrylics adhesive qualities (as you are diluting the amount of acrylic ‘binder’ in the mix). However, for this stage of the painting this doesn’t matter, as we’re painting directly onto the canvas. We want the paint to ‘grab’ onto the canvas and soak it. If you mix in too much medium at this stage it can cause a resist to the further layers of paint adhering onto them as easily. Keep the mix thin and ‘lean’. Pro tip: If you are finding the paint is pooling in small droplets on the surface when you are just using water you need to add a dash of ‘flow release medium‘ to the paint. This will help to break down the surface tension and make the thin layer of paint soak into the canvas. How do I apply an Acrylic Coloured Ground? Pro Materials: (Tear off the disposable palette, Cranked handle palette knife ( I use a number 45 RGM palette knife), water mister, Golden fluid Acrylic. 1. Lay old newspaper on the floor, or work on a really old floor or table. 2. 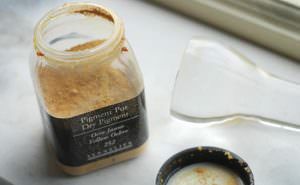 Mix the Yellow ochre in a jam jar/old mug or plastic tray with water until it’s the consistency of milk/single cream. Student Quality paints will need less water than artist quality paints. 3. Grab some kitchen roll in your left hand (because your bound to get some unwanted drips when you first start). Pick up the canvas. Paint around the edges first, trying not to get too much overflow onto the front of the canvas. Angle the brush to minimize bristles sneaking over the front of the canvas. Apply the paint with a scrubbing motion to ‘push it’ into the canvas so it soaks into the canvas. 4. Place the canvas on the floor or low table. Then working quickly brush the paint from left to right to cover the canvas. 5. When you paint there will be darker streaks of paint on the edge of the canvas because the bristles push it out. You have to keep working backwards and forward to smooth out the indiscretions. 6. squeeze the brush in the kitchen towel to take out most of the moisture and then gently go over the canvas again working from left to right, overlapping strokes and lifting the brush at the end rather than working back and forth. Watch out for drips on the side of the canvas and if your too enthusiastic watch out for spray from the brush. Pro Tip: I premix a whole airtight plastic container with a ground colour so I don’t have to mix the perfect consistency every time. Pro Tip: I Use Golden Fluid Acrylic paint as it has a stronger staining effect than watering down Heavy body paint. Pro Tip: If using Acrylic ground for oil paint make sure you add water to the acrylic. As acrylic is plastic based it can cause a skin that the oil paint will sit on top rather than sinking into the canvas. Pro Tip: If you add too much paint to the initial layer the paint won’t behave the same on the weave of the canvas. You’ve unwrapped your canvas and got a lovely coloured ground painted. Now we need to have a quick understanding of brushes so we have the right tools for the job. These brushes are off the hook, brilliant for decorating at home as well, come with a little cardboard ‘brush house’ to keep the brush in shape between uses. Look out for sets for sale as these can be really good value. I predominantly use Golden paints as I find the colour saturation really good and the Titanium White has some amazing opacity. They also have a huge range of mediums, Gels & varnishes. Thanks Alexis, pleased you enjoyed it. Hi Liana, I’m not sure I fully understand your question, what blocks on the paper are you referring to? thank you very much, I am a beginner and do not speak english very well, but I find your advice very usefull. Thanks Maria, really pleased you enjoyed the article. Hi Glenn, it varies depending on the rest of your colour scheme, but you can start with a black canvas if you’ve got a good quality white for mixing colours to paint over the top. Thank you so much for this very important info. I paint in oil so now I know how to prepare my boards. The way you explained, it terrific, and so easy to understand. Thank you very much. Pleased you found it helpful Rona. Thanks so much for this website and this advice! I’m trying to teach myself to paint and your site is the best resource I’ve found online so far. When I find a job (darn economy) I’d like to take a course, but for now I really appreciate your generosity in sharing these lessons! Hi Will, your site and your teaching is sensational, love it. Am an aspiring artist and this helps so much. and your profile photo is hilarious, makes me want to laugh too! Thanks thanks thanks! Thanks, pleased to hear the site is helping, I think the photo captured my best side! Are you beginning painting or drawing? Your site is brilliant and fresh. I am both drawing and painting, but prefer painting …applying that buttery texture of oils is just so enjoyable. What surface would you recommend a beginner to use? Aside from a prepared canvas, ready primed and stretched, there are Canvas Boards, Canvas pads (like the Fredrix real canvas pad),Canvas Paper and paper pads . Should I try any of these? I am using Canvas boards at present. Aside from a prepared canvas, any of the surfaces you mention would be fine with Acrylics, it’s all down to personal preference. Canvas boards can be great to start on, you just might find that some of the cheaper brands repel water so using a coloured ground will really help. Give them a go, experiment a little and see which ones you prefer. I prefer a prepared canvas because you can work thinly or thickly and it prepares you for doing larger scale paintings. You were right…much better than the boards. The canvas holds the paint better and it is far easier to vary the amount of paint especially when blending. Also the whole thing just looks better! I managed to find ones which were over 12oz and triple primed in a medium weave. First I want to thank you for the wealth of useful information that you have shared on your website. I love the conciseness of the knowledge you are giving here. I am a beginner in painting and trying my hand at acrylics and referring to your website a lot. I am a bit good in drawing but fail to make my painting look quite real which i would love to. I love landscapes and abstracts.Do you have a book coming? I would love to read it. Computer screens really tire my eyes :-( At present I am searching for helpful books on acrylic painting. Its hard to choose from so many options out there.Anyways i have a question for now is it necessary to prime canvas board or canvas paper? the seller told me it was pre primed but i can prime it nonetheless. How important is that? Or should i use a colored background directly? Pleased you’ve been finding the articles helpful in understanding acrylics, here’s an article about How to gesso an acrylic painting that should help answer a few of your questions. I think a book should be on my New Year’s resolution list! I’m glad you asked Jay because I am a beginner getting serious about painting. I had been using canvases and then canvas panels which just felt blocky and obstructionist to me. I did a quick study on watercolor paper and found that I like that more. After googling Fredrix real canvas pad, I ordered some from Amazon. Can’t wait! So your note was very helpful to me. I am loving your site so far, so much wonderful info. I am picking up a paintbrush again for the first time in 18 years and I am learning so much from you, thank you! Hi Michelle, Thanks for your kind comments, really pleased to hear you are picking up a paintbrush again, if you have any questions just post me a comment. Are you working in acrylics or oils? Hi Will. I am using acrylics. I tried oils a long time ago but wasn’t too sure about them, not exactly sure why but I know that I prefer acrylics and even watercolor over oils. Painting really is a personal preference, it’s great that you have experimented with other mediums, it really is the only way to try and find your own style. I have painted in oils for a few years, trying various things starting with an aqua BG and painting, after reading, and looking at cetaceans from every anatomical viewpoint…painting whales from a below the surface perspective. Knew this would get old, so I had to paint some rocks, sea bottoms, shore, et cetera. As I realized I needed to paint other things…I did, with varying success..enough to make greeting cards to friends and all that. I love oils, however they take months to dry! So, thought I would try acrylics, but with no knowledge of viscosity, flow, and a few other things, where to start? Found you, and your very approach appealed to me off the top! I would be interested in a book setting forth the truths in your videos, at least something I can read/watch, and learn as I do so. Is there indeed, or plans for such an item as this upcoming? Thanks for leaving a comment, sound like you’ve been busy with the oils! It can be a bit of a shift coming to acrylics, but there are many similarities, hope the website has been helpful. I have been working on a book on the fundamentals as the read/watch technique can work well! Hey Will, thanks for all of this! Your website and videos are the best painting tips/tutorials I’ve seen. You do a great job of explaining all the techniques you’re using as you paint, and never just skim over something without teaching it first. I like how you explain the “why” about a lot of things, or the way of thinking for beginners. Keep up the good work! I’ll be checking your blog for details about the book you mentioned in the above comment too. Thanks for the comment, really pleased to hear that the tutorials are helping your paintings. The fundamentals can be so important when you are first starting. Have you done any paintings before? Found your site from YouTube and soooo glad I did. Years ago I painted in oils using Bob Ross techniques and I learned a lot. Wanted to paint again but not get into messy oils again. Figured acrylics was the way to go. Just used your free videos to paint my first ever acrylic! Thank you. I think I have watched all your others too! You’ve taught me a lot and I look forward to learning more. Thank you! Great to hear from you, glad the videos are helping you find your way with acrylics. You have a gift of making it all sound so simple and fun! Your candid approach takes the anxiety of not wanting to mess up and actually try it. :-) Thank you for all of hard work and effort in putting this site together!! Thanks very much for your comment, often the thought of what may go wrong with a painting stops students even starting, and this is a real shame, because just taking things a little bit at a time, step-by-step can really produce some fantastic results. Having fun with your painting helps you relax and is a stimulus for your own creativity so it is a win-win situation! I started painting 40 years ago in oils and it seems like I remember using gesso for texture,ex. Waves.now I’m using acrylic and I was told that gesso will help prevent white spots, probably a primer? My ambition is to paint a river. Is gesso the product I need? Also, do you have a general list of all “start-up” supplies I would need? Including canvases, brushes, paints, palettes, etc.? Thanks so much for your website. It’s really fantastic. Great to hear you are plucking up the courage to start painting. Sounds like you have managed to pick up most Of the things you need. I don’t have a specific ‘start up list’ as I usually have a list for each specific course or workshop. Canvas wise I would usually recommend a pre-primed white canvas that you can then add a toned ground to yourself. The Isabey are great brushes for acrylics. In terms of a round brush any synthetic will be fine. The only other thing is a palette, in my demos I use a tear off palette which can save on washing up! Paint wise the recommended colours in my basic acrylic paints post is a great start. I am new in using acrylic..your tutorial really helps me improve my painting skill..thanks..
Great tips and a wonderful way of making difficult things work out so simply! I had a small question, though. Does preparing ground, work for oils too and if so, should we use oil or acrylic, as the ground medium? Glad you enjoyed the article, yes the techniques works well with oils also, if you are working with oils you can use either acrylics or oils as the ground colour. With acrylics make sure you dilute the paint slightly so the ground colour isn’t too thick. Otherwise the oil you paint ontop won’t be able to ‘grab’ onto the paint beneath. I am really enjoying your website, I love the methods and techniques you have been describing, they are really clear and well presented. I also really enjoy your music taste! I have been quietly painting for a while but only recently started communicating and sharing ideas with other artists. So far I have been presenting paintings with a painted canvas edge but would like to now frame a few. I wondered if you could give any advise the process of about varnishing and framing. Great to hear you have been enjoying the site ( and music!) For a painting where the canvas edge Has been painted I often ‘float frame’ my paintings. This is where there is a 0.5 to 1 cm gap around the painting and the frames is flush to the front of the canvas. It is a nice contemporary way of framing a canvas without it feeling too traditional. I’m very glad I found your site! Definitely the best free resource I’ve found. I’m only a beginner but thanks to your tutorials i now just take it one step at a time and i’m not so intimidated by the white canvas anymore. I just tried painting on a prepared canvas in yellow ochre and it does make a huge difference. Thank you for all the tips and you do a great job explaining all the how’s and why’s! You’re welcome, the coloured ground is so effective in taking the ‘fear factor’ of the white canvas away, so pleased you are finding the site helpful in your painting. Hi Will, I was greatly inspired by your videos on youtube. Great job!! I am thinking of doing the ‘landscape painting’ on a normal sheet (not canvas) which is slightly thicker than the usual sheet of paper. Is it OK to apply ground color on that?? or will it make the sheet soggy?? It really depends on the thickness of paper, and how watery the mix. If you have some watercolour paper about 340gsm then it will be fine. The sheets or board won’t be as absorbant as the canvas I painted the demo on so the paint will slide around a bit more, just something to be aware of. I am also very new in starting to develop my passion for paint, texture and color with acrylic painting and love your site and all the helpful information that you have provided! I have a question for you about preparing your canvas. If I am more interested in doing abstract art at the moment (really playing around with texture and color for the moment), is it still essential that I ground my painting with a base color? I am finding it hard to know what base color I would want to use for this purpose. Thanks for your kind comments, personally I always work on a coloured ground. If I’m working on portraits, landscapes or abstracts, I’ll always apply a coloured ground. However, it’s not essential, you can of course start painting onto the white canvas straight away but it makes it harder for your eyes to judge tone. When deciding which colour to paint the ground it all depends on the colours you are drawn to or the mood you are trying to create. The ground colour could be a hot pink, a muted grey or even black. Try a few test pieces on some paper, you might find that you personally prefer a white base, or discover a colour that suits your style perfectly. I’ve recently started painting – the thought never even enter my mind until 5 or 6 weeks ago! I have only just discovered your webpage and I am so glad that I have. At present I am teaching myself but am considering going to night school to learn how to paint with acrylics. It’s probably a good idea and to also meet ‘fellow’ artists! Just one question about the pre-primed canavases. They seem very rough and almost pixelated by the squares formed from the weave. Will grounding or re-priming the canvas help to to reduce the rough and effect causing brush strokes to deviate and cause unpredictable and frustrating results? I hope that makes sense. Thanks again, Will. Take care and keep up the great work! Great to hear you have just discovered the joys of painting! Your question makes perfect sense, essentially the smoother the surface, the more realistic the style of painting. If you prefer a very realist approach a very fine canvas with minimal weave (or a prepared board that can be sanded to a flat surface) would be the best option. If you want a bit more movement and impressionist technique in your work a medium grain canvas is best. Grounding and re-priming the canvas will take away the weave, however, the weave is key to help to pull the paint from the brush and create a broken texture in your marks. I am absolute amateur and was wondering how to do the background when I found this!! truly amazing…really really helpful. Hello! I was just wondering, do we really have to unwrap the canvas if it’s prepared? If so, why and do we have to put it back on? You just have to unwrap the canvas from the cellophane, you don’t have to take it off the stretcher bars. Really pleased you hit upon the site, great to hear you’re getting out the brushes again. One of the first places to start with your scene would be using this very technique. Use a darker coloured ground (Prussian blue or Ultramarine blue dulled down with a touch of Burnt umber) and you’ll have a great base to start your painting. Looking forward to helping refresh your painitng skills!! Hi will. I am beginning a sunrise (as in just breaking) over a rough sea acrylic painting, what would you recommend for a ground? and where can I see some of your work. Do you have an on-line gallery? Hi Pete, for a sunrise the yellow ochre can work really well, as it can give you some lovely oranges in the sky. I currently don’t have an online gallery of my works, I sell my original paintings through Whitewall Galleries in the UK. Hi Will, many thanks for the advice and info on your paintings. I am an 11 year old trying to start painting. I was searching the internet and looking for ways to paint my pictures when i came across your site. Do you have any tips on how to paint a pre-drawn pencil picture with acrylic paint? Please reply because I am afraid of messing up. Thank you for the wonderful site and keep up the AMAZING work you do. Pleased to hear you’re enjoying the articles. I start almost all my paintings with a simple pencil line drawing, just have a look at any of the free tutorials and you’ll see how they look. Make sure there isn’t too much pencil on the picture as it can mix in with the paints and grey them down. You’re welcome Alli, pleased it helped you to get started. First off let me say wow! I’m so glad I found this site! I have been painting on the side and occasionally selling my stuff for the past 15 years. My family is very artisty so I always get a lot of tips from them. But there are times were I just don’t know what to paint! I love painting in fine details and when ever I want to start another painting I have anxiety. I just never seem to know what to paint. And I wish I could just start wth a blank canvas and just paint and not pick up a pencil and draw it on the canvas? how do I overcome the fear of just putting the brush down and relax and not go into fine details??? Also, I use acrylic mediums so it drys fast which tends to dry extremely fast. Which is better? A retarder golden acrylic? I wish I could just start with a blank canvas and just paint and not pick up a pencil and draw it on the canvas? It sounds like you want to ‘free up’ your painting style with a much more gestural, impressionistic approach. One of the most challenging yet effective ways to accomplish this is to paint outside. Even if landscapes aren’t your thing, trying to paint a moving cloud or moving branches, forces you to look at the essential elements of a scene, rather than getting hooked up on the details. If this sounds too bigger leap, find the biggest brush you’ve got, set a timer for 30 minutes and complete a painting in that time with the large brush. 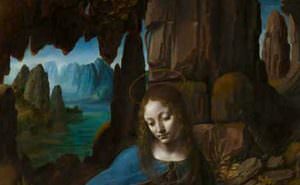 You might find this article on ‘Is the devil in the detail?‘ interesting also. A retarder will help to slightly slow the drying time, personally I use Acrylic Glazing Liquid gloss most of the time because it is more flexible in its uses. Do you have a book out? No, not at the moment but I’ll keep on writing articles on the blog until then! Good luck with your novel, enjoy experimenting with acrylics! I just started painting, though I’ve bitten off a little more than I can chew by choosing for my first project “The Reader” by Fragonard. So wished I knew about canvas prep before I painted her face and dress- its not bad for a beginner, especially considering that I’ve obviously have been cluelessly working backwards, but I really want to thank you for your tips on mixing flesh tones (and now also on canvas prep for my next project (Poppy Field in Argenteuil by Monet)). Your easy-to-follow videos have been an immeasurable help. As a new subscriber to your website, I look forward to reading all of your advice and, moreover, watching all of your vidoes to help be become a decent painter. Thank you! Hi Laurene, thanks very much. Great to hear the videos are helping you to become a better painter! Using a tonal ground can really help. Thank you for your amazing website! This is just what I’ve been looking for. Your choice of topics is superb. You have selected the topics that really make a positive difference to painting and go on to demonstrate them in a very easy to understand and entertaining way. Above all thanks also for explaining the use of grounds from the start – it’s so important! Too many books and art classes I attended left this vital step out. In some cases I applied grounds to build up a “glow” in the painting and didn’t understand why these pics worked and other paintings didn’t. At last I attended a course at an art academy where they explained grounds on the first day and my whole painting approach got turned upside down. This was good but also came as a shock! I still have a burning question left over from my pre-ground days, though. I like to paint buildings and it’s important to me to get the perspective right and for the lines to look convincing. If I draw on the canvas directly, it’s easy to correct lines. But if I then apply a ground, I can’t see my lines anymore. If I draw on a ground and want to adjust pencil lines, I find my pencil slips around and I smudge things and it ends up in a mess. I’m not at a level where I can draw freehand and a building is recognisable as such! So, I tend to draw on grounds only if I’m drawing organic shapes like trees and flowers or where accuracy is not an issue. What do you think? Thanks for your kind comments, glad the articles are just what you’re looking for. There is a fine line between having your ground too thick or thin. If it’s too thick the paint (acrylics) will form a plastic resist, making it hard to for the pencil to make a mark, or at least one you can easily see. If it’s too thin, you can see too much of the white pre-primed canvas showing through. What you can do is dilute the paint with water, add in a few drops of acrylic flow release. This will break the surface tension of the paint and give you more of a stain effect, keeping the tooth of the canvas yet giving you an nice opaque colour to work on. You could also try Stabilo special pencil that doesn’t smudge and can be used on plastic, metal and glass so even if you work on a thicker ground, you will still be able to see your lines. They also come in a light colour, so if you’re working on a darker ground, can be very handy. Some sound advice, I’ll give it a go! Absolutely LOVE your site!!!! Thank you. After I do the yellow ochre base color, should I draw the basic lines over the yellow before I actually start painting with my acrylics or will the drawing show through? What would you suggest drawing with? I have hear a hard pencil, soft pencil, chalk, or even not to draw on the painting at all. What would you suggest. I am painting a bright colored picture of a sailboat with blue sky and blue water. Thanks for any help you can offer! Hi Stacy, you can draw over the coloured ground lightly with a pencil, the actylics will easily cover over any pencil marks. Watch the start of this video to see a demonstration. Thanks Ana, pleased to hear your finding the tutorials helpful. i am an aspiring artist. I have been doing drawing , sketch for last one year and has improved consistently with time. Using colour has always been difficult for me because i couldnt get the right colour tone at first place, so dropped the idea. After learning few of your articles, got the confidence and now i believe until i try it myself, my color sense would never improve. I would request you to provide guidance over finding one’s own artistic style and what recommendations you give artist to develop his own signature style. Great to hear from you and pleased to hear you’ve found the confidence to give colour a go. Thanks for the suggestion for an article about artists finding their artistic style, I’ll put it on the list. Thanks very much Lesley, really pleased you’re finding the tutorials helpful in your painting. You’re ARTicle helped me a lot.I am a visual artist teacher here in the philippines and I learned so much from your tips. Sad to note that my students have no enough materials for oils and acrylics- too expensive. Anyway, I just want to acknowledge you’re good and informative site. Congratz! Hi Christoph, nice to hear from you. Really pleased you’ve been finding the articles helpful in teaching your students. I am painting a large canvas of an owls eyes and the picture is going to be mainly dark blues and blacks .. would you recommend painting it a light gray colour first ? Hi Sophie, you could go for a light grey and that would work, but if you have a good quality white I would be tempted to paint the canvas black, then you can paint the owls eyes ontop. I was reading your post on applying colored ground on white canvas, can I use Oil base for applying the ground color or it is better to have the acrylic as a base, the painting will be oil. Yes you can use oil for the coloured ground, it just depends what colour. You need to use an oil that is relatively fast drying so any of the umbers, raw umber, burnt umber etc are a good choice. Just apply them with some odourless mineral spirit. 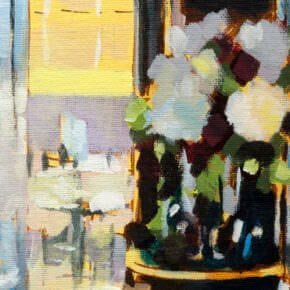 If you are mixing the colour with white then use a fast drying alkyd white rather than a standard white, as titanium white is a slow drying oil paint. P.s if you have a look at the portrait pdf I talk through the different white options available. This site is brilliant, I love drawing and would really love to expand my knowledge into painting I have started one already, but recently I saw a video of a man using spray paint, another thing I would love to learn, what kind of surface would you recommend and any tips would be good. Hi Darren, thanks, pleased to hear you’re enjoying it. You can get acrylic spray paints from Liquitex ( who have recently just launched acrylic markers) and with acrylics you can paint on pretty much any surface, from paper, to canvas, metal etc. Applying gesso gives a smoother surface to paint onto, here’s an article on it. Hi I loved this video. I am just beginning painting, and when I watched this I right away tried it. Now, Thanks to you I can paint. Cheers Taffy, pleased to hear it helped with your painting breakthrough! I LOVE your online “classes.” I am a hairdresser, and as you said, we do know how to rectify a bad color situation. I have taken 3 art classes at our local college, but have never learned anything like the things you share. I jumped into my first painting class, never having held a brush before. You give such good elementary lessons on choosing paints, brushes, etc., and how to even start a painting. I had no idea how to begin using a canvas, or what colors to begin with, so I bought anything that caught my eye or felt good in my hand. Consequently, I have tons of paints, brushes, and paper, waiting for me to use them. Now, I can be more confident choosing the right ones, thanks to you! Unfortunately, our college doesn’t see art as an important part of their curriculum, so I welcome you into my home via the internet. Nice to hear from you and thanks for your kind comments. So pleased you’ve been enjoying the lessons and as a hairdresser you’ll pick up colour mixing in no time! Enjoy putting all those materials into practice, these free acrylic lessons are a great starting point. This website is fantastic! I wish I had come across it sooner! I have started a painting using acrylic paints and unfortunately I did not know about the prepared canvas technique….I noticed when i hold it up against the light of a window you can see streaks/appears see-through in spots… I’m assuming it’s because I didn’t prepare the canvas first. If only I had read this post last week! :) Wondering if there is any way to fix this, other than starting over with a prepared canvas? Hi Tanya, pleased you’re enjoying the website. The only thing you can really do is apply thicker paint to cover over the see-through spots. However, it might not be as bad as you think, because the painting will be displayed on a wall you won’t have that strong back light to the piece so you might just get away with it! Thanks very much! Sometimes just getting started with one painting is the hardest step to do. is yellow ochre the only colour ground you use or are there other colours that work well? great site too and thank you. Hi Melanie, I don’t just use the yellow ochre, but most of the ground colours come from earth colours. So burnt umber or raw umber, often mixed with white. If you look at the start of the free cherry tutorial I show the difference in warm and cool between the raw umber & burnt umber mix. i hav been painting a lot.. but never hav gon for any classes rather than my school’s art period… i was stuck with oil painting for long and now started with acrylics..i was happy to see your site after checking lots of videos in youtube.. finally found a good one..thank you! the thing is i start to paint patiently but somehow in the middle get a feeling its started took ugly ..and end up spoiling it most of the time..fun time ends soon for me..i would love to paint at ease rather than worrying so much..i have “basics” acrylics..is it good enough?. You’ll find with most paintings they go through that ‘ugly’ stage ,so don’t get too discouraged! The ‘basics acrylic’ paints are o.k to start with just invest in an Artist quality white, you might be interested in this article on the differences between the two. hi .. thanks for the great advice i had a query though..my painting has different elements in it..major one being fire..with lot of orange and yellow and red. and there’s back and brown and gold too…So what ground color should i use? And also could you give some tips on how to go about painting a face on canvas?? Thanks! A coloured ground is always best if it’s a mid tone, so not too dark or not too light. Also, not too bright, and not too dull. This way when you add your darkest darks and your lightest lights you can judge the tonal effects of the painting, and judge your colours to the ground. So for your painting a muted orange/red would be a good start. For a classical oil portrait painting technique have a look a this series of tutorials. I am just a beginner at painting. I wanted to know what should i start with like landscape portraits sill life etc. and this site of yours is very useful thanx a lot for creating such a site. Hi Moniel, I’ve just updated a ‘Guide to the Will Kemp Art School‘ this talks you through my approach to teaching and some of the recommended sequence of tutorials. Thanks, Wil. I have used coloured grounds with my acrylic and oil paintings. I use Raw Siena or Yellow Ochre. I didn’t know that I should start on the edges, so I have learned something new today. Thanks. I enjoy reading and learning from you. Cheers Margaret, pleased you enjoyed the demo. Painting the edges is a personal preferencw of mine as you can then continue the scene around the edge. This can work particularly well with box canvases as it feels like the scene continues on. My brush just doesn’t seem to be picking up the paint. It takes me ages to cover the white little spaces on the canvas. Plus I’m mixing the colour, and so I have to use A LOT of paint just for the coloured ground. Any advice? Have you got the consistency of the paint right? Dear will. You are a top bloke. You share your great knowledge. You have a generous spirit as well as being a great artist. Thank you loads. You’re welcome Jen, very kind of you to say so! Great site, thanks for making it. I am using student grade acrylic paints. A lot of them are very transparent, like the yellows. If I use a colored ground of yellow ochre or burnt umber for example, when I put a stroke of yellow over it the transparency of the paint will show the yellow ochre or burnt umber through it instead of the white of the canvas board or canvas, and will then be a lot darker because of it. Doesn’t something like a transparent or semi-transparent yellow or red paint need to be painted over a white surface to have maximum brightness? Yes, you might come into this issue with student grade paints. The pigment load (especially in the yellows) can be transparent compared with an artist quality alternative. If you have a artist quality titanium white mixed with the yellows it will help to add to the opacity. In oil painting and acrylics you can also paint onto a white surface to achieve these effects but it takes practice. For example, the Pre-Raphaelites painted onto a white ground for applying thin transparent glazes to the face. This keeps the luminosity of transparent pigments (As a result of the light going through the transparent pigment and reflected off the white primer) and to make use of the transparent nature of the paints, however, If they made a mistake they did not paint over the area but scraped back to the primer and started again. So yes, if you have a specific painting that you want a maximum brightest from a transparent yellow then go with a white, but trying an artist quality yellow might just transform the technique when painting on a coloured ground. Yes, the transparency of student grade paints is hard to work with. I can’t just cover over mistakes or make changes real easily with a semi-opaque paint. For example, if I was painting a lemon on a black table and I painted the black over the outline of the lemon by accident, I couldn’t use the yellow paint to cover over the black and regain the contour of the lemon. It would be too transparent and I would see the black through it no matter how much yellow I put over it. So, that means I would have to carefully paint the black around the outline and make sure to not cross over it. But that goes against all the advice I’ve heard from books like Harold Speed’s and many others that say to paint boldly and not be afraid of covering up outlines. But I can’t paint like that with semi-opaque colors if I want to have the contours accurate. Is it the professional technique taught in the art academies to only boldly paint over outlines when the paints to be used for that part of the painting are opaque enough to regain the contours? You just need to try an artist quality yellow that is an opaque yellow, Cadmium yellow would be your best choice. Because you’re trying to cover black, you’d still might need a couple of coats, but it will enable you to paint in the traditional technique. Below are the comments from another student who was having the same issues with his student quality yellow and these were his results after using an artist quality paint. Thanks a lot for clearing that up. I bought some artist quality cadmium yellow and you were right. It is much more opaque than I thought it would be and it easily covers over a prepared canvas. Thanks again for making this site and the youtube channel, they are a real help. Take care. Good one Robert, pleased you had success with the cadmium yellow. Just found all these delicious articles and I’m making it part of my to-do list to read one completely each day as there is so much, it’s overwhelming but I just read through this one and I’m wondering why you use water to mix with your paint to prepare your colored ground as opposed to using say a gloss medium since water if too much is added tends to break down the binder of the paint and also dulls it due to the refractive quality of the water in the paint. I use water for exactly those reasons, I want a dull matt surface so the next layers of paint grab onto it. If a gloss medium was used it can give you a slippy surface to paint onto. Sometimes just using the water will make the paint pool in little droplets, if this is the case just add a few drops of ‘acrylic flow release’ and this will help break the surface tension. Anyway, quick question – forgive me if you have already answered this in your long thread above – I have painted my canvas with yellow ochre (artists) the consistency of custard. I’m wondering if my custard might be thicker than yours because it really looks quite ‘bold’. Will this truly work as a ground for any painting? I was thinking of painting a German Shepherd (dog, not human hahaha), but if I wanted to do a portrait would the same ground also work? I saw your umber/white ground on your self portrait and it looked amazing but much more natural than the yellow ochre. Nice to hear from you, the yellow ochre is a great colour for bright landscapes and townscapes, you can then adapt the colour of the ground depending on the subject you are painting – A more subtle colour for a portrait or a brighter colour for an abstract. Yellow ochre is just a handy starting point. The consistency should be more single cream than custard, you’re trying to stain the canvas surface so you still have some tooth of the canvas to work with. That’s very helpful, thanks! I think I accidentally went for clotted rather than single cream. I’m planning to make quite a large painting on a large square of free canvas rolled out on the ground. I’m using a roll of preprimed basic canvas.. So my query is as i’d like to thicken it out with extra primer of some sort, making it stronger yet quiet malleable to roll. I would like to make this light enough canvas almost weighed and aged by the application kind of like the feeling of an old wax jacket. It doesn’t necessarily have to be a oil finish, as im not sure if im going to be using oil or acrylic yet. Im planning to paint on the ground in public and it will take a lot time to finish so ill be rolling it up and out many times, taking it out and bring home everyday, therefore these extras layers will make the large sheet of canvas just more substantial as in durable also. If anyone gets the kind of feel for how i want to process this pretty flimsy large rectangle of canvas, before i take it on to the street then Please let me know what i should do, or any suggestions would be appreciated greatly thanks. It’s quite tricky to get that flexibility with a light canvas as often the pre-primed primer used can make it brittle, depending on manufacturer. In an ideal world I would start with raw unprimed canvas about 12oz in weight. 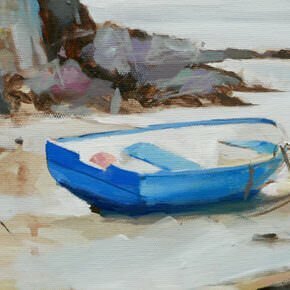 This will give you a good mix of flexibility and durability, then if you’re working with acrylics rather than oils will also give you a greater level of flexibility in the piece. Sorry this doesn’t help with your current canvas but it’s hard to make a thin brittle canvas thicker and more flexible by adding mediums to the surface. I love the net just for the fact that I can learn from people like you. Generous and every things explained so simply. Thanks Sarina, kind of you to say so. Here goes nothing…..and i do mean nothing. I used to draw people ages ago and have never painted but i have a canvas in the other room and plan on painting on it? Tomorrow? I told you here goes nothing. So glad you are here and i found this! Go for it Dianna! The canvas in the other room deserves to make it to the easel. Good luck with your first painting! Speaking of which….i have not had an easel for quite some time. Used a chair to prop up canvas. Okay its a rather large canvas 18 x 24 inches. Uh, i have large aspirations? Went to the store twice today. Bought wrong paint. Ugh. Will i be able to cover inadequate paint? Hi Dianna, if you have artist quality paint you will be able to cover over pretty much any paint underneath, with student grade paint (especially in the yellows) it can take a lot of layers to achieve the same level of opacity. How did you know i was using yellow? My experience with my firsr painting has been very interesting. I washed clothes in between paints. Now i know why artists just splash water on their face in the morning….so they can go paint while the lighting is good. And i feel more whole. Signing up for your drawing class next week. Artists Intuition!! Enjoy experimenting with painting and see you on the drawing class! Great tips for someone who hasn’t tried landscape, still life and portraits with acrylics. I have only tried watercolor portrait painting. I want my paintings to be more vibrant, as I find acrylic easier to work with. Yours is a really great Site!! I am a beginner in painting. recently have started trying one stroke painting ( I am at a below beginner level I think :( ).. tried to paint an iris directly on canvas (which i bought in Michaels – its pre-primed).. My strokes were good but it didnt create the richness of colour on the canvas and looked pretty neat on simple white paper. In the above video, in materials tab – you have mentioned water, which I couldnt understand where to use. Did you apply water to canvas before that yellow ochre? If I want to paint on white background, Can I apply water on canvas first and then start directly painting a flower? I mix the yellow ochre in with the water so the mix is more like a ‘single cream’ consistency. This was the colour stains the canvas without loosing the canvas tooth. Thanks Will :) !!! I tried it and wowww the strokes were so smooth.. Really thank you very much…. Good one Mamtu, pleased it helped. If the subject of my painting is going to consist of a range of light browns (going from, say, between raw sienna to yellow ochre to titanium white), would you suggest starting out with a ground color from the opposite side of the color wheel, like something in the blue/blue-violet range? My subject is one of my dogs that passed a little over a year ago. She was a yellow labrador. I’ve already done a study of what I want in pencil to map out shading and contours, as well as various blends of color and brush stroke combinations to get a feel for painting her fur… was about to start out on a stark white canvas until I came across your page here and I must say I’m glad I did — it seems like quite a valuable piece of information. A subtle ground colour from the opposite side of the colour wheel could work well, have a look at this article on choosing ground colours and studio wall colours. This is a great tip! I’m about to start an abstract oli painting on a canvas (36″ x 36″) and have a large area of ivory white backgroud..with slight coloured streaks.. What ground colour would you recommend to use? Have a look at this article which looks at some of the different ground colours you can use and why to choose them. i have painted few black lines on one of my new white canvases but i don’t like them any more.can i repaint over them with white acrylic to start again fresh?will they hide?how many coats do you think are enough?the background of my painting is white. also for white background paintings do you suggest its good to have ground of yellow ochre or something.or is it ok to start painting after it is prepared? If you’ve got artist quality titanium white you will be able to cover the black lines with 2 or 3 coats. With student quality paints it will take much more longer to cover the black, but will still work. You can paint onto a white surface, but a coloured ground can help with so many areas of your painting success. Have a look at this article on choosing a coloured ground colour for your painting. Hi will, what if we just gesso it again instead of covering with white? Doesn’t the white acyrlic paint then interfere with the absorption of other colours on canvas? Doesn’t it look like it has been painted all on top then? Hi Saran, for this technique you cover the white with a colour, rather than working on the white canvas. Thanks for your advice, I’m still a beginner and I don’t actually quite understand some things, it’s not your fault, it’s mine because I didn’t study well enough understand painting language. Well I have some questions, I actually put some acrylic white paint on my canvas, do think it will help me paint well? My second question is, I actually samesandpaper and I was wondering if 150grits will work? My last question is if I just take out my canvas and start painting on it, will anything bad happen to my painting? 150 grit sandpaper is fine, if you’ve started your painting onto a white canvas nothing bad will happen to, it will just make it harder for you to judge colours and tones if you’re trying to create a realistic painting. I have a question..how can I avoid glossy effect of acrylic color? Hi Moody, acrylics don’t usually dry glossy but if you want a super matte finish, just apply a matte varnish to your painting once its finished. I am a beginner, looking to do my “own” acrylic painting. I say “own” because I have done several kit-based, copy-from-masters type of paintings that turned out pretty good, so I was emboldened to try something more original. I stumbled upon your site when trying to figure out what materials I need to start out. My question is: if I were to buy a ‘traditional canvas’ from an art supply store, would that be pre-stretched and/or pre-primed or should I somehow unwrap it from the wooden frame and prep it with gesso? Sorry if this sounds naive, but I’m confused and would really appreciate your help. Brilliant news that you’re starting with acrylic painting. This comments is a bit tongue in cheek and all I meant was that students often buy new canvases that are wrapped in cellophane with the best intentions to start painting but they end up just letting them get dusty on the floor as often the first brush marks are the hardest! If you were to buy a ‘traditional canvas’ from an art supply store, that is pre-stretched onto the bars, and is white – this would have been pre-primed with Gesso, so you’re ready to paint onto it straightaway. If you were to buy a ‘traditional canvas’ from an art supply store, that is pre-stretched onto the bars, but is not white, more of a natural canvas colour, you don’t need to unwrap it from the bars to Gesso it yourself, you just need to apply the gesso directly to the stretched surface. Your site is very helpful for people like us who wants to dabble in colors , and your pic has good positive vibes, which is infectitious. A question : you mentioned in response to a question about framing .. could you please elaborate it..
i really admire your tutorials but i have a question, i draw alot of geometric elements in my paintings and i usually have to use markers to have them come out really sharp, but at the end the texture of the marker is very different form the acrylic and it’s very obvious in sunlight , how can i avoid that? 1) Apply an isolation coat to the finished painting to give you a solid, even sheen. 2) Use an acrylic marker, such as these from >Liquitex, which will allow you to draw your geometric elements with actual acrylic paint so you won’t have any of the textural issues. Hi Syazana, have a look at the colour on this black and white portrait tutorial, it’s a raw umber and white mix. I am thoroughly enjoying your tutorials. I am a beginner in acrylics and would like to know, if you can thin the Golden Fluids acrylics like yellow ochre or raw umber, etc. with water for priming your canvas. What would the ratio be? In your tutorial video you are priming quite a small canvas, but when you are putting a ground on a 48″x48″ (or larger) canvas, that will take a lot of paint and would cost me too much. I am a pensioner. So pleased you’re enjoying the tutorials, yes you can dilute the fluid acrylics with water, this will make the best mix, so it soaks into the canvas a bit, and creates an opaque yet thin covering of the canvas. I would try this technique on a 12 x 12 or 10 x 10inch canvas first amd experiment with the painting process. Thanks so much for this, you are so very helpful. Could I also mix a bit of the Golden Fluid Acrylics or even Heavy Body Acrylics with Acrylic gesso and use that as a ground? Yes you could mix it in with the acrylic gesso and use it as a ground, but you’ll find sometimes you lose the ‘glow’ of the yellow. When you have a white base to start with, let it dry, and then paint on the thin coat of the yellow ochre, the yellow ochre will appear a brighter yellow, due to the white under it. Try a couple of small swatches, one mixed in with the gesso, one without and see which tone you prefer. I really need a grey color on a canvas. You said that grey will look black. How do I get a grey back-ground? Hi Cynthia, optically a grey can ‘appear’ black when painted onto white, as apposed to painting a grey onto black. To get a grey background just use a black and white or a raw umber and white. Your site is awesome! Can you recommend the best way to attach heavy objects to canvas? I have attached many items with some strong glues but I am attaching a bike and am looking for suggestions. I enjoy working with abstract art. Hi Brenda, thanks for your kind comments on the site. When you said heavy objects, I wasn’t quite imagining a bike! The best way would be to actually attach it to the wooden frame structure of your canvas, but by doing this you would also have to go through the actual canvas surface to attach to the frame and this might not be the look you’re after. The other method would be to actually ‘sew’ the bike onto by weaving through the canvas using thin metal wire. This would help to spread the weight, and you could also glue at the same time. I had never heard of this technique, but after trying it out I can really see the difference! At first I was a bit nervous since I typically paint in blues, but the overall quality of my work is so much better now. I just wanted to say thanks for sharing this tip with the rest of us and I am so glad I found it! Good one grace, really pleased you gave a coloured ground a go and got some good results! 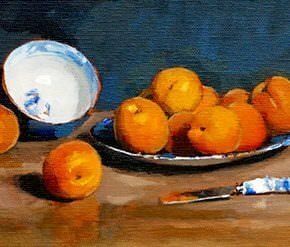 Pleased you’re finding the site helpful learning oil painting techniques Zunaira. Everything I paint looks like I am looking down on it. How can I correct this. I painted a seascape and the boat doesn’t look right. Just found your website and am enjoying it so much. Hi Sheryl, pleased you’ve been enjoying the website, the ‘looking down’ on a subject is a common issue and stems from perspective drawing, to correct the feeling is to do with checking the angles on your initial drawing. Just about to start putting paint on the canvas for the first time. Really nervous. Really enjoying your website Will, it is encouraging ….. But still nervous I will make a mess of it all. Hey Linda, go for it! the great thing about painting with acrylics is you can easily paint over your painting if it all goes wrong, pleased you’re feeling encouraged to face the fear and the canvas. Interesting site., thanks for providing it. I have been trying to paint in oils. Find acrylic dries much, much faster but has not the gloss/sheen of oils. However, I would like to get away from brushes because of the cleaning agent and use palette knives. Tried it on boards, as I am not sure whether or not I cut the canvas. Not easy to use, but like to persevere. Any hints? Did not see all your promotions. Just found this site, Also am a bit old (80) and not exactly computer literate. Pleased you’ve been finding the site interesting to read through, you might find this series of palette knife painting tutorials with acrylics interesting, many of the same techniques apply. I use the same technique Will….but I’m doubtful whether it goes with every painting. Nice to hear from you, using a coloured ground can work really well when you’re first beginning painting to achieve great results and understand the principles of how painting works, as you’ve mentioned you also use the same technique. I say at the top of the article I use it in 99% of my work, so yes there are some occasions when using a white ground can be the best choice. See this How to paint glass demonstration for an example. However, I’ve found as a teaching method for transforming a beginners learning curve to painting, the coloured ground technique is hard to beat. I have drawn off and on through the years a little but I have just begun to paint. I started a couple of months ago using acrylics. I am 65 but I have found it is never too late to start. Have paintings of both my pups already. Your online info has been very helpful to me. I have no training and it has been a great help. Thanks for making this information available online. I hope to keep learning! Really pleased to hear you’ve been finding the tutorials helpful in developing your acrylic painting techniques, 65 sound like the perfect time to start! Is there a video that you have prepared to show how to blend colors together. At this point my lines are a little too precise. Any info would certainly be helpful. Thanks in advance! Hi Ron, Nice to hear from you, I don’t have a any specific ‘how to blend colours’ videos, you might find this video helpful. Your Art school has open the door for me a second time! Thanks to you & your school I am returning to what I love most! . Pablo Picasso said it: “Art washes away from the soul the dust of everyday life.” Thank you! Hi Diane, so pleased to hear you’ve been inspired with your art again and you have been finding the website helpful. I read about your technique and I’m wondering if you would also use this if you will be painting something that is white. Let’s say the entire picture has some pretty dark tones but there is this one spot that is entirely white. If you first painted the entire picture with a dark color, would you still be able to paint over it with white? Hi Sarah, yes you can still use this technique for white objects, if you used an opaque white such as titanium white you will be able to completely cover the colours underneath. It can be harder to achieve with student grade paints as they aren’t as opaque as artist quality, but the white is a really good investment in your painting. I’m wanting to start painting and I’m just confused about what to use. I ultimately want to paint chunky abstract pieces. Maybe even more palette knife types of pieces. Would oils or acrylics be better for this? Also, I am confused about which preparation to do. Do I need to apply a gesso as well as a toned ground? And does that differ for acrylics and oils? As I’m just starting out, I’ve just bought art store pre stretched canvases. Any suggestions on anything (techniques, paint brands, etc.) would be very helpful! The pre-stretched white canvas you’ve bought already has gesso on it, so you can paint with either. Nice to hear from, sounds like you’re thinking along the right lines, more like out for brunch! You can vary the coloured ground colour depending on the subject you’re looking at, and the mood/feel you’re after. This article looks at art studio wall colours, but the same principles apply. Try to image you can peel back layers of the image/scene you’re looking at until you find a colour that ties it all in together and then go for that and hopefully that confidence in the perfect ground colour will come through in your painting! I am a beginner and found your site to be helpful in providing basics to start painting on canvas. I have a pre-stretched canvas and student oil paints. I am confused if I need to tone my canvas as youv’e described in the video. Hi Bharti, you can use this technique with oil paints but it will take longer for the ground colour to dry, try using an earth pigment that dries quickly. The ‘ground colour’ is short for ‘background colour’ and describes the colour you paint your canvas before commencing the painting. You can re-gesso, but you’ll loose some of the qualities of the canvas surface. Some canvas manufacturers apply a thin coat of lacquer after they applied the Gesso which helps to protect the surface when shipping/transporting etc. So good for shipping, not so good for painting! A good test to try it just add a few droplets of water onto the surface of the canvas and see if it soaks in or if the droplet just stays in a droplet form on top of the surface. If the droplet stays in a droplet form what you can do you is mix in a few drops of ‘Acrylic flow release‘ to your acrylics, this will help to break the surface tension in the paint and give it a more staining effect. You’re welcome Jeanne, Happy New Year! It is our point of reference in our life frequently changes our viewpoint. Sometimes good and sometimes this change is bad but it is our viewpoint that influences how we feel. If you want to achieve the warm yellow ochre feel you can just mix a more muted yellow using the primary yellow as your base colour, it doesn’t have to be straight from the tube. Got given 7 large canvasses 2 years ago they’ve been sat in my office. So glad I discovered this site my 6 year old and I raring to go! Great to hear it Jacqui, enjoy the lessons! I am getting into portrait painting in oils. What colour etc. would you recommend for the background? Hi Baiba, it all depends on the sitter, but I often go for a mix of raw umber and white so it is nice and neutral. Yes, that’s right, depending on the skin tone, clothes in the portrait etc determines the best choice of coloured ground to work with. I don’t add any mediums into the oils to thicken them, but usually use a mix of turpentine, linseed oil and dammar varnish depending on which layer I’m working on. Hello and thank you Will – really helpful website. I’ve just managed to use an entire 20ml tube of ochre to colour my canvas! I was using it neat – no water. It was difficult to get much coverage out of it – wouldn’t spread nicely. I’ve since guessed I should have watered it down. I’ve now done so and it looks fine but what (if any) will this have on my painting? Yes, that’s right, diluting the paint with water to a milk/single cream consistency is best for applying the first layer, its more like a stain effect onto the canvas. The thick paint won’t damage your painting at all but subsequent layers will be harder to ‘grab’ onto the surface as the thicker acrylic paint would have created a more shiny surface. Thanks Will – first lesson learned. Thanks for your time. We’ve all been there Emma! hope the painting turns out well. Hi I’ve just joined and I have leard so much by watch such few videos. Thank you for the great tips and information, I hope to use it soon. I was looking for good paints that I can aford and wondered if the Brand REEVES has good quality paints and brushes. Thanks if you can reply. Hi Chloe, please you’ve been enjoying the videos. Reeves paints are okay, but they haven’t got the best ‘pigment load’. So I would invest in a tube of artist quality titanium white, this will help to create opaque mixes. Thank you for all your helpful information on this website! Would these tips on colored grounds apply to acrylic painted on wood panel? How would you recommend prepping a wood panel? I tend to be attracted to bright and colorful work, like Kaws for example (http://arrestedmotion.com/2011/12/openings-kaws-–-focuskaws-modern-art-museum-of-fort-worth/), and am curious what kind of colored ground would work best for a bright palette? Thanks! Yes, working on a wooden panel with a colour ground is exactly same as working on a canvas. I would prepare the wooden panel with a couple of coats of artist acrylic gesso and then paint the colour ground on top. For a brighter pallette just use brighter colour grounds that complements the colour scheme you’re after. For the clean blocks of colour in the images you linked to you wouldn’t need a coloured ground, as they are such clean colours, separate from each other. For this you can paint straight onto the white gesso. Hi Jane, pleased you’re enjoying the website, to make the floor look realistic will be due to the perspective drawing of the piece, try drawing a small line sketch of the floor, when it lloks correct in a line drawing it will work like a charm in your painting. Hi Will, I am a rank beginner, guilty of buying diverse art materials/paints , pastels etc over 5 years ago and never setting aside the time from a very busy work life, to allow the creative urge room to grow. I now have the time, and do not know where to start, and found your web site! The first blank canvas is a bit scary. I want to try an acrylic painting first. I too have made the mistake of putting as neat acrylic (ochre) ground onto my first small/medium sized canvas after being too eager/impatient to start, as I did not have the golden acrylic or flow release. Can anything be salvaged from this first canvas/can I use it at all? Hi Lynn, yes you will still be able to paint ontop of the canvas, it can 100% be salvaged. For future paintings you can just dilute your paint with water to get the right consistency. I definitely use coloured backgrounds on my canvases before I start painting. i use earthy tones for landscapes and blue-greys for paintings with mostly sky in them. I also find acrylic painted back grounds better than Gesso. Great tips. I would like to share one I discovered and now use to great effect. It was used by the great Venetian artist Titian. For people he frequently used a green underpainting, then applied flesh tones on top. I mix burnt umber and liquibn for overall underpainting then Indian yellow and ultramarine for the underpainting in human skin. Then I mix titanium white, and burnt sienna for skin tone, adding dabs of blue or red as appropriate. This works brilliantly and yields the complicated sub-surface scattering that makes skin tones so vibrant in good painting. This I do in oils but I imagine it will work in acrylic. Thanks for sharing Robert on your use of a Verdaccio underpainting. You might find this article of interest. Good one Sheila, the garden scene sounds like the perfect painting to try a coloured ground on. Hope you enjoy the results. Thank you Will for a great article and the helpful tips! I just painted the sky on the gessoed canvas and can see ugly white patches. So I need to paint it again. Wouldn’t have this problem on the coloured canvas. That’s it Tania, even with a very subtle colour as your base colour it can make the actual painting process so much quicker. Enjoy experimenting with different colours! Thanks you Will for all your help!! You’re welcome Tamara, hope you’re keeping well. Hi John, thanks for your kind words about the site and pleased you enjoyed the lesson you purchased. In terms of using the medium with the acrylics, it’s a matter of preference and dependent on the actual brand and consistency of the acrylic paints you’re using. For example, I usually create my coloured grounds using a fluid acrylic from Golden paints (I show some in the video at around 2min 50sec) which have already been thinned with an acrylic medium in the factory so don’t need any extra medium. I demonstrate with a heavy body paint as it’s the most common used when you’re first starting. If the mix is getting very watery then a squirt of medium will help to keep a good structure to the paint, but it’s by no means essential. For later thin applications of paint (glazes) I use an Acrylic Glazing medium, but don’t at this early stage as I want to keep a nice absorbent surface for the next layers. Thank you so much Will for sharing such good information! You’re welcome Carrie, hope it helps. Thanks Will this tip was most useful, though I don’t paint in acrylics, but Ibelieve I can underpaint a white canvas for oil painting with acrylics too. Keep sharing your secrets with us. They’re priceless. Yes that’s right Isaura, just thin it with water so you have an absorbent surface for the oil to ‘grab’ onto. Good one Glenda, pleased you’ve found it helpful. I’ve being trying different surfaces to paint on, I purchased a pad of canvas paper, but how do you use it? I painted an underground colour, then when it dried the canvas paper had rolled up so tight it was useless. I prefer to use the prepared stretch canvas, but I am finding the price of framing way too expensive, so now using smaller boards. Hi Cate, different surfaces will behave differently depending on the amount of water/thickness of the layer of paint you apply. With this particular technique if you apply a watery layer and are working on paper you need to keep it on the pad so the actual glueing holds it down, or treat the paper like water colour paper and tape the paper down before applying the coloured ground. Watercolour paper can work well with this technique as well. Thanks Kathy, pleased it helped. Thank you so very much for making this new video on “coloured ground”! I have been waiting for it. I am a very new beginner and this video motivates me to get busy painting. I appreciate your style of instruction. Your voice is so calm and reassuring. You take the panic out of painting!! You rock!!!!! Thanks Cathy, very kind of you to say so, pleased you enjoyed the lesson. Thanks for the update on colour backgrounds, still experimenting with it. Have a quick question for seascapes would it be best to use a pale green or blue as a colour ground for acrylics. Hi Chris, it depends on the blue you’re after, if you’re working with a Phthalo blue, turquoise colour having a soft glow of yellow underneath can really help to bring life into the scene. If the yellow ochre seems a bit ‘raw’ just add in a touch of titanium white to make a colour closer to a naples yellow. I am new in painting. I tried to have the yellow ocre on my canvas. Using Liquitex it is very difficult because the ocre is always visible under my colors. Hi Dominique, you need to make sure you are working with a good quality titanium white, which is an opaque white, so will help when covering over the ground colour. Hi Will! I wonder if you can help. . . Several years back I purchased an acrylic painting that looked very “evenly” matte. I have written the artist and she disclosed that she does not use anything but water to thin her acrylics and says she starts out painting very “lean”. She does not varnish the finished painting. When I finish a painting it has both matte and shiny areas. I would much rather it have a look that is overall matte. Her painting looks almost “powdery-flat-matte” but has a VERY pretty, consistent look. I have tried so many paints, both very good quality down to craft quality to try and achieve the same look. I wrote this artist again asking her what paints she uses and I didn’t get a specific answer only that “she uses any paint that crosses her path”. :-) I wonder if you can weigh in on this. What do you suppose is causing this effect that seems to be out of reach for me. I figure if this artist can achieve this look, then I can too. :-) I just wish I knew how. Thanks for a great site! Hi Jeanne, hope you’re keeping well. To achieve an even matte finish, you first need to apply a gloss ‘isolation coat’ this gives an even sheen to the surface and gives you a better surface to apply the matte varnish onto. It seems counter-intuitive but it will give you the best results. Then you can apply a matte varnish to the isolation coat. Here is an article on varnishing an acrylic painting. and you will have a lovely soft, even matte finish to your works. Will, thank you for your fast reply. I can’t wait to read this!! You are a gem!!! Have a great day! Thanks, Will. I always appreciate the information/gems you kindly share. Many thanks for your generosity in sharing such a richness of information. I have been painting for several years but still consider myself a relative beginner, so your website is invaluable to my efforts. My question today is what would be the best colour to tone my canvas for a predawn beach/water scene where all the colours will be cool. This painting is my first effort in oils although I think the principle remains the same. Hi Coralie, it depends on the feeling you’re after with the painting, having a subtle glow of warmth through either a muted pink or warm golden yellow would work well. With oils if you are mixing a tone with white use a ‘quick dry Alkyd white’ as standard titanium white is too slow drying for this first layer. Hi Aen, the painting techniques stem from a classical oil painting approach, so as long as you use fast drying oil paints for the coloured ground (or dilute the paint with mineral spirits) you’ll be away! This was really helpful, far more helpful than my lecturers at college who throw some paints and a canvas at you and expect you to know what you’re doing. I have little to no experience with acrylic paint or canvases and have to produce some artwork for an exhibition soon and I found this really helpful. I would have had no idea to put a coloured background down, which made everything a lot easier! Thank you. So pleased you found it helpful Zoe, good luck with your exhibition. of all the sites, and tutorials, yours just hit home with everything i hope to do. thank you beyond belief ! i want to do still lifes, and i have a quick question for you, if i may. i have several paintings ” started “, where they are mostly wash, a little more, but just starting. i painted directly on to white canvas, and want to correct that NOW ! is it possible, without bailing on what i have started with these 6 ” starters “, to add background now, maybe with a much lighter ” wash ” over what i have started ? it is pretty bass-akward i realize, but i really don’t want to start from absolute scratch as i have invested time and need to finish some to sell ( to friends first ), but realize my mistake right away ! do you think this is possible, not ideal, but maybe okay for these 6 ? i intend to take courses now ” before ” starting, so i learn before my mistakes…. Thanks for your kind words. Yes it is absolutely possible to apply a more watery wash over the paintings as they and to tone down the white and continue on with your paintings. The results will be slightly different due to the opacity of the wash, but the principles will remain the same. You’re welcome Lu, pleased you’re finding them helpful. Good luck with your paintings. Kind of you to say so Drishika, pleased you’ve been finding them helpful. Thank you for those lessons, I’ve been an artist at school and I really wanted to learn more and this helps me alot especially in this field of the arts. I hope you could send me a few of those tutorials and maybe I can ask you a few questions about it. By the way, I’m from Philippines and there’s no golden paints available here, can I buy them online? Pleased you’ve been finding the website helpful Safie, you can see a list of the free tutorials here. Hi Will: just stumbled upon your site and Wow — what a wonderful resource! I’m just starting out and missing lots of the basics, like how to choose/prep a canvass, how to mix colours, etc., etc. I was envisioning having to take several courses to get a grasp of the basics, but I think your excellent tutorials are just what I need. Also appreciate the wealth of ‘free’ information that you are generously providing. Hi Susanna, pleased you’re finding the articles and videos helpful. I’m certain that with some additional searching I’d be able to find the answer to this question, but I’m curious about prepping a canvas for watercolour painting. I do not have formal experience with visual arts, but I am attempting to get students interested in painting. I’ve read so many conflicting instructions on how to prep for watercolour, that I’m starting to lose my way. Any tips? Hi Lisa, you will always get the best results using watercolour paper, due to the absorbency of the surface in comparison to working with watercolours on standard canvas. You can prep standard canvas to work with watercolour but I would advise to apply a couple of coats of ‘Golden absorbent ground’ This will give the canvas surface more absorbency and work more like watercolour paper. You can also buy some specialist canvas designed specifically for watercolour, such as the Fredrix watercolour canvas. You can read more about watercolour papers here. And a brief overview of using Golden ground with watercolours here. I found your videos on YouTube when was looking for a beginners introduction to acrylic paint. I found them really inspiring and watched them all up! I bought a galleria starter box (believing that they are a slightly better grade of student quality paints than some of the others out there) and intend to get some artist quality titanium white (as per your advise) as soon as one of the shop around here get it in stock. I am now about to paint the 10″x10″ sunset from your tutorial. I bought some yellow ochre to do my coloured ground. It was not included in the set I bought, so I got a large tube, thinking I would get through it. I bought mine from a brand called Reeves. I am regretting not getting a better quality paint now as it is proving a rather glossy mix and seems to be rather waterproof so that my burnt umber headland has not stuck to it very well. It is all rather shiny and I am having to put my top colour on in layers. It not that the top colour is transparent so much as that it won’t stick to the coloured ground very well. I am only practising so it doesn’t really matter. I will get some better quality paint as you have advised numerous times! I am wondering whether I should just carry on to with my current coloured ground, try to paint over the whole lot with a better quality yellow ochre, or just start with a new canvas. Please can you tell me which coloured glazes you were talking about going at the end of this particular tutorial? I have read everything on your website about glazes, gels, mediums, varnish etc, but wondered what you did for this particular one. Thank you for making it so easy and fun for me to get started with acrylics. I have done some pencil sketches of a lovely view across some Devon fields near my house which I would love to try to paint during my upcoming week off. I feel empowered to do it now that your videos have given me some more confidence. Hi Caroline, so pleased you’ve been enjoying the lessons, I didn’t paint any glazes on the landscape painting, it was just a note on how I would approach it if I wanted a more realistic effect. The coloured used would have been to bring more vibrancy and warmth to the scene. I thoroughly enjoy your approach to acrylic painting, Will, and your instruction is most helpful. By chance, have you done any instruction in to the different kinds of acrylic additives and how they work, and the effect they have on finished paintings? I know you occasionally introduce them into whatever study you are working on, but I was wondering if you have something a bit more comprehensive on this topic. Thanks again for your inspiring classes ! Thanks. Hi Marty, pleased you’ve been enjoying the approach with acrylics, you might find this series of videos helpful on Acrylic Gels & Mediums. thank you for the advise. I’m an amateur, who has been painting on and off for about 10 years. I have no formal training, and ironically, I have always colored my canvases first. I always found it to be easier to build on….and when I can find a good bargain, I purchase canvas that has already been colored. I’m currently OBSESSED with black canvas. Good one Mica, pleased you’re having success with the black gessoed canvas. great stuff, are u on instagram (the photo app) -? Thanks Laurie, I’m not currently on Instagram, I’m #oldschool! As a beginner, is it safe if we go for yellow ochre on all types of painting whether it be landscape, portrait abstract and etc? More landscape/still lifes/abstract work well with the yellow ochre, you’ll see in the video a more muted colour for portraits. I have been painting for quite some time but I didn’t know how to prepare the canvas. You told about it so we’ll and easily that it worked very well and now I am doing that way and the painting is very impressive. Thanks a lot Will. Great one Mini, so pleased you found the technique helpful. 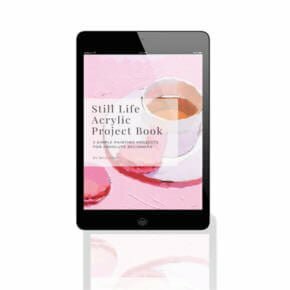 I stumbled upon this blog as it will be my first time painting on a canvas. I’d like to say, your blog is amazing! Spot on! It got me to read more of your other blog entries. So here’s the thing; I’ve tried painting before, but only on special papers and a few illustration boards. And I was really used to watercolour as it is easy to play with its opacity and intensity. I decided to try acrylic painting on canvas, and so I bought a small one that has been primed with acrylic gesso. I was nervous because when I touched the sides, it got dirty despite having clean hands. So I was thinking whether I should paint the whole canvas first with one colour or not. Would you please help me? Because I see my subject with more whites than other colour. I’m about to paint a half of a face facing towards a light, focusing on the eyes (still debating whether it’d be in a coloured or black and white). So should I paint my canvas first in one colour? Or do I start a light sketch and then paint? ..Also, in general with regards to acrylic painting on canvas, would it be better to draw in pencil first? Or paint the canvas in one colour, then sketch? Thank you for taking time to answer your readers’ questions though we think you’re busy and all. May God bless you and more power! The choice is yours depending on the result you’re after, I always recommend a coloured ground to start with because it can help in so many areas of your painting. The best way to see how I approach it is to follow one of the free tutorials, hope you find them helpful. hi im doing an art assignment and i have to create an Andy Warhol inspired artwork. What colour would i use for the toned ground? And could you give me tips to make it look really good. Hi Caitlyn, you wouldn’t need a coloured ground for a Andy Warhol inspired artwork because many of it was based on flat, screen print colours, so wouldn’t ever have a coloured ground showing through. Hi Will ! I love your videos but i’m new at painting and i would like to know if i must use first primer and then paint background colour. Hi Manos, if you’re using acrylics and the canvas is white, it already has an acrylic primer on it, so you are ready to paint. What a treat for us to have you just giving away your precious knowledge. Thank you. I have a question about colored grounds. I am starting a painting of a single white flower; the background will be charcoal. The outer petals are looser from the rest and are translucent and so they have a dark, shady look, even though you will know they are white. The center of the flower is tighter and appears more creamy-almost yellow. Is it possible to block in different colored grounds, knowing what layers will go on next? 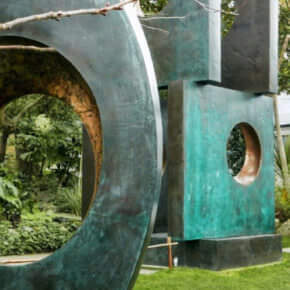 Hi Sunny, yes you can use different coloured grounds but usually you would choose a general tone or colour most suited to the style and mood of the piece. Hello! You really seem to know your stuff! I’m currently stuck on what/how to do a landscape inspired piece. When you say to use yellow orche for the coloured ground, do you let that dry before painting over the top? We are doing the topic ‘landscape’ at school and it is due 6 weeks from now. I want to do abstract, arcylic paint on a massive canvas… however, need to do way more practise with ‘abstract’, I’m no good! Any tips? Hi Chloe, yes, you leave the background to dry first before painting on top. All abstraction is based on reality, so find a landscape scene you like and then remove elements from it one at a time until it is abstracted. Thank you for your great advice, input, tutorials, etc. I’m a beginning artist and they have been of great help! One quick question please. You indicate that one of the mistakes beginners make is not to unwrap the cellophane from new canvases. I purchased a large canvas because it was 40% off and therefore a great price even though It’ll probably be at least one month before I will use it. If I shouldn’t remove the wrapping to protect it until then, what do you suggest? Also, I can only store it laying flat/horizontally is this ok? Hi Vivian, hope you’re keeping well, the comment on not removing the cellophane from the canvas was a bit ‘tongue in cheek’ – as in, many beginners buy a new canvas, and leave it wrapped and never actually get to the painting stage. For storage it is best kept in the cellophane wrap. Ha Ha, pleased you enjoyed it Baiba! confidence to have a go. Thanks. Wonderful information on your whole site! I have been using gesso to prime my canvases but think I might try your tip of color grounding. Hi Tracy, pleased you’ve been enjoying the tutorials, coloured ground can make a big difference in bringing all the colours together, hope you have good fun experimenting. Will: I stumbled on your website — what an awesome resource. I’ve just begun my painting journey at the ripe old age of 49 :-). I’m an engineer by training and have now discovered how much I love to create art. I didn’t think it was possible, but a little patience, practice, and great insight from a true teacher and professional like yourself has been such a blessing! Thanks for all you do to share your gifts! Hi Chris, great to hear from you and thanks for your kind comments, so pleased you’re finding the lessons and tutorials helpful on your journey into painting! Hey, I have recently started on an acrylic painting and I’ve painted the background with acrylic paint already, and now I wanna try oil painting instead. I wanted to know if there was anyway to correct it so that I can paint with oil instead? Hi Elyse, if the acrylic painting is quite thin you can paint the oil paint straight ontop. Thanks for sharing all of what you have mentioned her. I’m new to canvas painting. M trying to learn it by myself and this site has been very helpful. I would love to know more about the basics. What will u suggest I do? Hi Amy, have a look through the free video tutorials. I first want to THANK YOU for your videos and lessons on here. They have been extremely helpful in my work. I had my first art show it went great. I had no idea what to expect but the gallery was easy to work with and helpful to a new artist like me. My question is where do I go from here? Keep trying to do shows in other galleries, website (which I have but not successful) I love to paint and I’m not trying to make a living off it because I work many hours at my job however it is nice to make some room in the house by selling some paintings. Do artist continually do shows? Hi Brenda, thanks for your kind comments on the tutorials, in terms of selling works there isn’t a one sized fits all answer as it can vary greatly depending on your style of work, time commitments etc. Shows and exhibitions are a direct route to clients and are great thing to get your work seen to a wider market. Thanks Eugene, really pleased you’re finding them helpful. You’re welcome JP, hope it helps your paintings. Really love your site. Thanks for sharing you expertees. I have always loved to draw and paint since childhood, and now retired have the time to indulge. I have a question? Can I paint over old painted canvases? The ones pre- stretched From art/ craft stores or do I just need to dispose of them? Thank you so much for you kind help and wonderful site. Hi Kathy, yes you can paint over them, aslong as the mediums match, so acrylic over acrylics and oils over oils. I’m curious about one thing, Wil. If canvasses are primed with acrylic, won’t oil over acrylic also work? Hi Robert, yes you can paint oil over acrylic, just not acrylic over oil. Hi, I live in rural Australia and we have a total lack of any kind of paint classes. Thank you for stepping onto the internet so those of us disadvantaged by location can still learn and be happy. I prefer to paint in oils. Could I use this method of toned background to start an oil? Also can I use acrylic to make the toned background or would it be best to used a thinned down oil? Hi Kim, pleased you’ve been enjoying the lessons. Yes, either method would work, thinned down oil and then left overnight or acrylic. As long as the acrylic is applied quite thinly so the oil paint can still adhere to the canvas. Thank you Will! I would never have known to do this had I not come across this blog. I would have wasted lots of money of paint and would have been frustrated in the process. I’ve found all your posts and tips to be very helpful! I now refer here regularly. Hi will, thanks a lot for the very useful website, I have one question for ya : what do you think about using ( airbrush medium or glossy medium ) instead of water to mix will the acrylic colors , I’ve heard that the painting will last longer if you don’t mix the colors with water , and it’s one of the biggest mistakes that artist are doing !!! What do you think about that ?? Hi Haneen, yes it can be good to use mediums when working with thinner layers of paint in the later stages of your painting so you retain a solid paint film. Just a quick question, without going into a huge amount of colour theory, how do you choose what coloured ground to use in a landscape or seascape? Is it a matter (of a beginning) artist just trying different things out and seeing how they work or is there a rule of thumb that can be used as a guide when trying to decide on the colour to use? Hi Kim, it’s often due to the mood you’re trying to create or choosing a colour that brings all the tones together. Just like choosing a wall colour at home, the paint colours will provide the brighter accents but you need a more muted harmonious tone underneath to bring them all together. You might find this article of interest, just change the studio wall colour for the coloured ground colour. I am a real beginner and am so grateful to find you on u tube. I so want to be able to paint but am finding it hard to know just what I would like to start with. Thank you so much for you sharing your skills and willingness to teach, I am looking forward to starting . You’re welcome Faye, pleased you’ve been finding the lessons helpful. I am just starting painting and your website is extremely helpful. so, Thank you so much! I do have a question for you though-Should I prime the canvas as well as use a tonal ground? Hi Erin, most canvas you purchase from the art store will already be primed so you can go straight on with the coloured ground. I just discovered your site. Great information! An earlier post asked a question about painting over old painted canvases. My question is this. How do you prep the canvas? Do you just use the coloured ground colour or do you prime it first with gesso? Hi Anne, if you are working over an existing painting I would apply gesso first and then the tonal ground. I have a huge urge to start painting but just can’t seem to get going. I always get diverted for whatever reason. To become a good painter, how much time to I need to devote to the craft. I think that this Website is really helpful. Hi Fred, it’s hard to give a definitive timeframe as all artists have different working practices, but many of these free painting tutorials on the site can be completed in a couple of hours. They only use a few colours, so you can just get going without getting distracted. Hope you find them helpful.